Qantas domestic passengers in Australia will soon be able to board with a carry-on as heavy as 10kg after a wave of passengers passengers complained to the carrier that the current allowance was way too small. The rules which will go into effect on March 25th come after passengers went against the airline for rigorously enforcing their ridiculous 7kg allowance for passengers. Qantas has some of the most restrictive and confusing carry-on rules in the industry and they simply don’t make any sense considering that a 7KG “allowance” is really nothing as a proper carry on bag by itself often weighs 3-4KG already. You can access Qantas baggage allowance policy for carry-on here. The changes aren’t publicly announced on the Qantas website, as of now. There is yet another set of rules for the small Dash 8 flights as well as international flights. All in all one can say though that a 7KG rule is absolutely ridiculous. 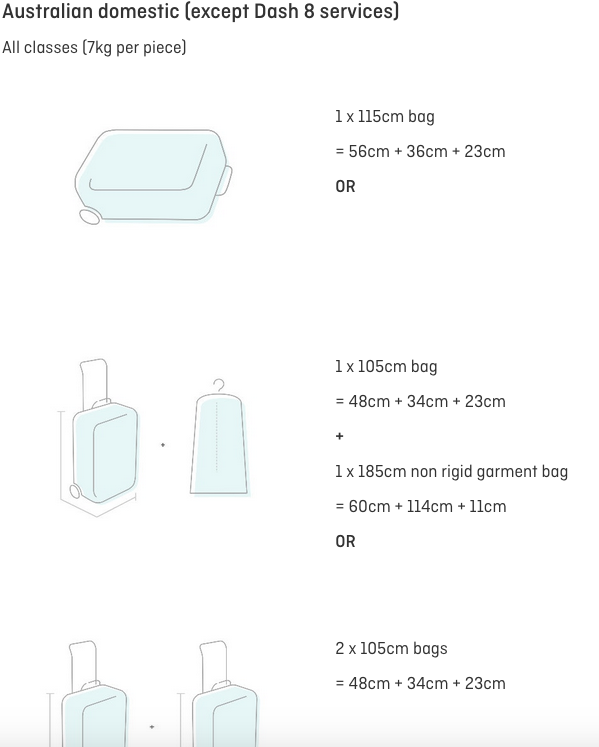 From March 25th 2019, domestic travelers can bring on board one piece of cabin baggage weighing up to 10kg and a second item (I won’t call it a bag) weighing up to 4kg. Currently Qantas domestic passengers can board with two bags, both with a limit of 7kg. The total cabin baggage weight limit will still be 14kg per person, but what changes is essentially allowing one bag to be heavier than the second to move closer to realistic limits to what an average carry on bag weighs. … The physical size limits on cabin bags will remain the same and passenges can still bring on board one small “personal item” bag, such as a handbag or slim laptop bag, in addition to the two carry-on bags. The rule change follows a trial by Qantas over the summer that included weighing passengers’ cabin bags and asking for feedback. Of those, about 40 per cent had bags weighing between 7kg and 10kg.Qantas Domestic chief executive officer Andrew David said the changes gave customers more choice in how they used their 14kg allowance. “Most customers on short business trips and weekends away only travel with one carry-on bag plus a small personal­ item,” Mr David said in a statement to news.com.au. I call BS on the safety concerns about carry on baggage. Yes, one should be able to properly handle the own bag but there is zero concern about bags not being safe if they weigh 7KG or 12KG as long as they are properly stowed in the overhead bin. Australia is one of the most restrictive countries when it comes to flying with carry on’s and weight enforcement. I’ve never seen such rigorous gate agents as those working for Qantas before. It’s about time some common sense moved in there! It’s almost impossible to have a carry on that weighs 7KG. Even my lightest Tumi bag has a weight of 3.4KG and that’s obviously empty without anything inside. Travelers in Business Class aren’t safe either from the Qantas Baggage Gestapo and passengers are forced to check in their bags. Not really what I want to do, especially when shelling out for a Business ticket.